The Yamaha MG8/2FX may seem a little expensive, but for the acoustic performer who wants total control over voice and multi-pickup instruments, choosing the MG8 makes a lot of sense. Excellent sound quality. Great digital effects. Ease of use. Pricier than close rivals from Mackie and Behringer. Yamaha's popular range of MG series mixers has received a bit of a revamp of late and now offers built-in digital effects in both the 8/2 and 12/4 configurations. This compact mixer is already chock-full of features, such as four low-noise mic preamps, three-band EQ, insert FX and switchable 48V phantom power. Effects comprise 16 patches in four groups. The first eight are various reverbs, from hall and room to stage and plate, plus a special drum ambience setting, while the remainder offer a range of chorus, flange, phaser, auto wah, vocal echoes and distortion. Colour-coded controls and clearly defined sections make using the MG a breeze. The user manual is exceptionally well written and includes some useful professional mixing advice. Yamaha has salvaged some valuable space for a more comfortable mixing experience by employing clearly marked rotary pots as level controls instead of the more common sliding faders. In our studio and live tests, we were blown away by the both the quality and depth of the FX, and the power and clarity of the three-band EQ. 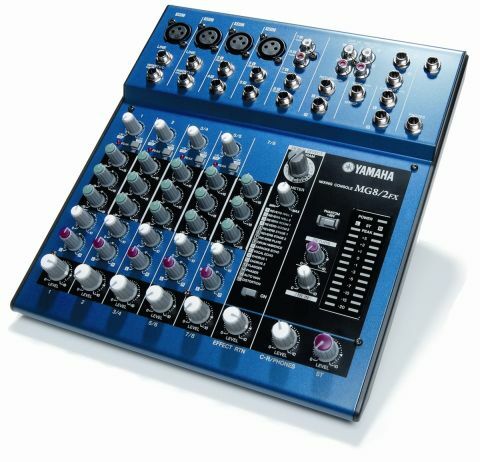 Compared to its Behringer and Mackie counterparts, the Yamaha MG8/2FX may seem a little expensive (power supply is included), but after spending some time with the MG, it´s easy to see why this is so. The mixer is designed for the live musician and even features a footswitch socket to control the onboard effects. An optional mic stand mounting bracket is available for £26, so for the acoustic performer who wants total control over voice and multi-pickup instruments, or for the increasing number of players performing to backing tracks, choosing the MG8 makes a lot of sense.